The coupled Discrete Element (DEM) - Lattice Boltzmann Method (LBM) often suffers from the high computational cost due to the fine meshes used. The intrinsic parallel nature of DEM-LBM makes it possible to be applied to the analysis of realistic engineering problems using parallel computer. 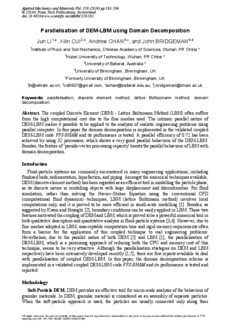 In this paper the domain decomposition is implemented in the validated coupled DEM-LBM code FPS-BHAM and its performance is tested. A parallel efficiency of 0.72 has been achieved by using 32 processors, which shows a very good parallel behaviour of the DEM-LBM. Besides, the feature of ‘pseudo-vector processing capacity’ boosts the parallel behaviour of LBM with domain decomposition.